May 16: Oklahoma City bomber Timothy McVeigh is scheduled to die by lethal injection in a federal prison in Terre Haute, Indiana for the murder of 168 people. As of the beginning of May, 28 people had been executed in the United States in the year 2001; a total of 711 men and women have been executed since the death penalty was reinstituted in 1976. In his “Reflections on the Guillotine,” Albert Camus provided anti–death penalty adherents their strongest argument against the idea that capital punishment is a deterrent to crime: An act of premeditated, administrative murder, the death penalty is carried out in cloaked isolation, by a society which really doesn’t believe in the sanction’s supposedly exemplary value. Historically, the statistics on the persistence of capital offenses prove him right, and what society harbors behind the facade of intimidation, Camus noted, is simply revenge. Timothy McVeigh’s scheduled execution for the Oklahoma City bombing is but the latest consequence of a long trail of senseless violence pinioning viewers nightly in front of their TVs. Politicians have deftly utilized the fear born of four decades of uniquely modern carnage, and the retaliatory inclination for the death penalty, favored by two-thirds of the nation, has assumed a peculiarly American fervor — one whose possibilities invite consideration. Imagine televising death penalty proponents assembled in a bar at halftime of Monday Night Football games, the way visiting teams’ fans are often shown. TV monitors along the walls display, in split-screen, the barroom and the inside of a prison death chamber. Those in attendance are a select group, publicly representing a national audience, gathered to witness an execution — carried out not by the state but by the family of a murder victim. What occasions such a possible scenario is an idea that has been obscured by the larger debate over the right or wrong of capital punishment, and one we are obliged to examine: The possibility that, perhaps, as a consequence of one of these monstrous murders, the only way the family of a victim can ever regain psychological equilibrium is to see the perpetrator executed. And that the state, for the sake of argument acknowledging that deterrence is a sham, would permanently turn over to next-of-kin the ability to salve their grief. Revenge thus reclaims, if you will, integrity by becoming personal. 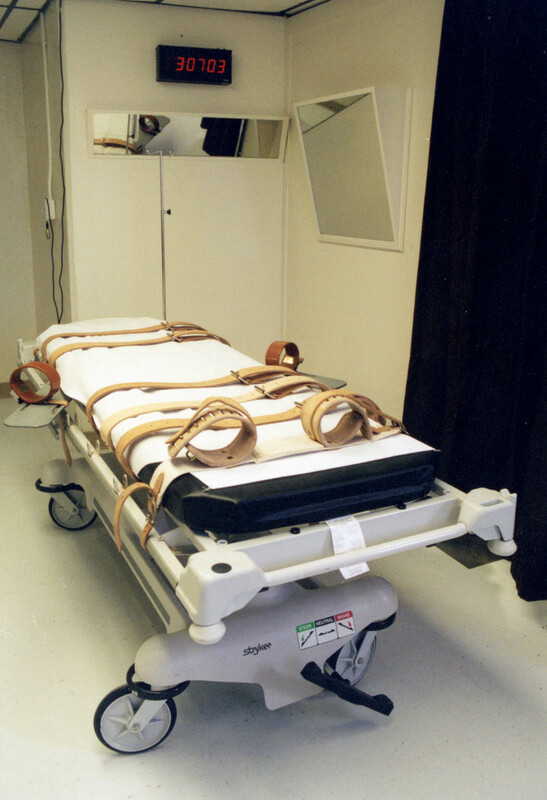 Attorney General Ashcroft’s announcement that Timothy McVeigh’s execution will be broadcast on closed-circuit to the relatives and survivors is, in effect, the state’s de facto admission that retribution rather than deterrence is at the root of capital punishment. As constituted, however, such a limited broadcast and the retention of government’s ultimate hand in the matter will do little to advance families’ already-elusive quest for “closure” in capital cases. McVeigh is typical of recent killers who exhibit pathological disdain for their victims, the justice system, and their own fates. Families and survivors are rendered even more powerless in these instances. A blink, a momentary grimace of terror from the killer at the prospect of his imminent demise, some sort of gallows tic that might be revelatory of a hint of humanity — in the absence of contrition, these substitutes that the families hope might approximate justice and ease their pain are denied them under the present procedures for executions. Ashcroft’s half-measures only make matters worse. Were McVeigh instead forced to face the nation as it watched him, and if he knew that the families in the chamber observation room had their own hands on the button, he would be without the apparatus of the state to finally blame. Emotionally, that would afford the families at least a glimpse of a level playing field. The barroom witnesses should certainly include children, and they should be encouraged to ask questions of their parents about the proceedings. The witnesses will view the unhooded face of the condemned on one half of the monitor’s screen, and view themselves on the screen’s other half. The nationwide audience will be afforded a similar perspective, and the condemned will be able to see the crowd on a chamber monitor. A populace overwhelmingly disposed to retribution is thus enabled to view itself celebrating its solidarity for what it also believes is a just and equivalent act. It watches itself instructing its children, in real time on Monday nights, on the efficacy of capital punishment. The aura of secrecy and darkness associated with the state-as-executioner is replaced by open national camaraderie and demonstrable family values tutelage. Would such an ongoing spectacle exacerbate our sadistic instincts or induce revulsion? Would an aggrieved family who might ultimately decline to deliver reprisal then suffer the displaced and instantly visible rage of a nation which expected its notion of justice to be honored? Or would we eventually come to glimpse ourselves as codependent participants in the equivalent of a snuff reality show? Clearly, here, we’re afforded an opportunity to learn much about who we are, as distinct from who we think we are. At the very least, transferring the privilege to execute from the domain of bureaucrats to the victim’s family deprives the act of its abstract status. It is no longer merely something the state does in our name. It is ours, finally and truly, to deal with, and the debate and our character as a people can only be clarified as a consequence. John Hutchison. An earlier version of this piece appeared in the San Francisco Flier. An execution is not simply death. It is just as different from the privation of life as a concentration camp is from prison. It adds to death a rule, a public premeditation known to the future victim, an organization which is itself a source of moral sufferings more terrible than death. Capital punishment is the most premeditated of murders, to which no criminal’s deed, however calculated can be compared. For there to be an equivalency, the death penalty would have to punish a criminal who had warned his victim of the date at which he would inflict a horrible death on him and who, from that moment onward, had confined him at his mercy for months. Such a monster is not encountered in private life.